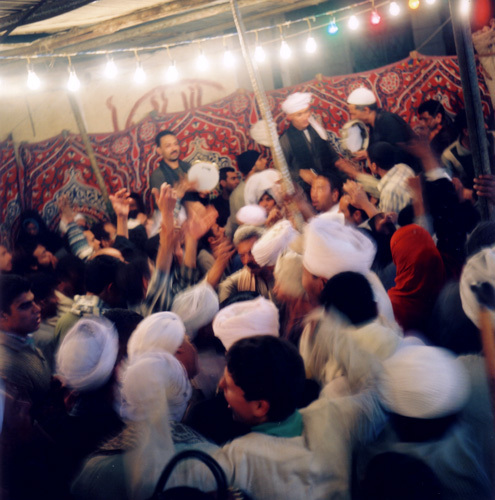 Sufi dhikr to the tune of religious music at the mawlid of Sidi Ali Zayn al-Abidin in Cairo. The most spectacular part of mawlids is Sufi dhikr. Dhikr means literally the mentioning or invocating the name of God. In Sufism, it also means a specific ritual of meditation, based on the repetition of names of God and often accompanied by music and a dancing movement of the body to help reach a state of trance. Critics of Sufism argue that music and dancing is not a proper way to express piety, but Sufis counter that if it helps one to feel closer to God then there can be nothing wrong about it. The Qur'an and the tradition of the Prophet Muhammad do not provide a conclusive answer to the debate: It is a question of different understanding of what it means to be religious: some see it including moments of strong emotion and ecstasy, while others believe that it should be exclusively disciplined and rational.